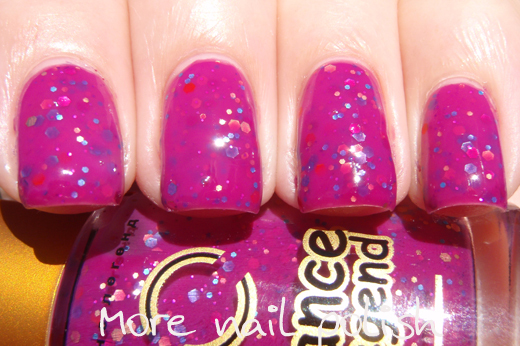 Here are a couple of fun polishes from Russian brand Dance Legend. 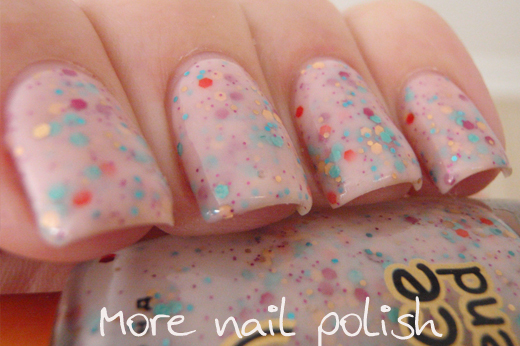 They all have a pastel milky base with glitter suspended in them. And they all change colour dramatically when exposed to sunlight. I can't find names on these, only numbers. 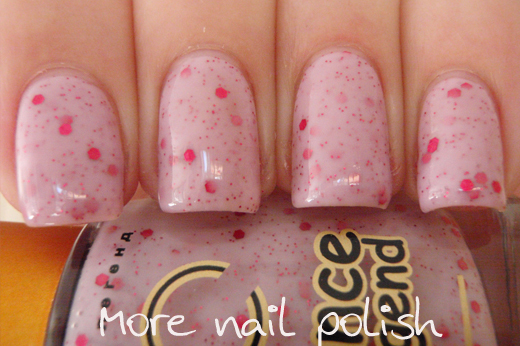 193 - This one is a pale pastel pink with bright fuchsia pink hex glitters in two sizes. This is two coats with Seche Vite top coat. Step out into the sun and the pastel pink base turns into a bright neon purple. 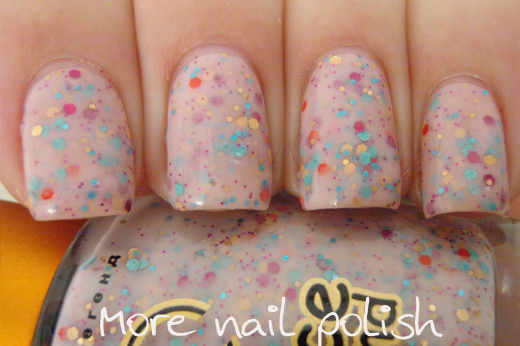 194 - This one contains a multicolour glitter mix in very light pink tinted base. There is red, hot pink, gold and blue glitters in three different sizes. 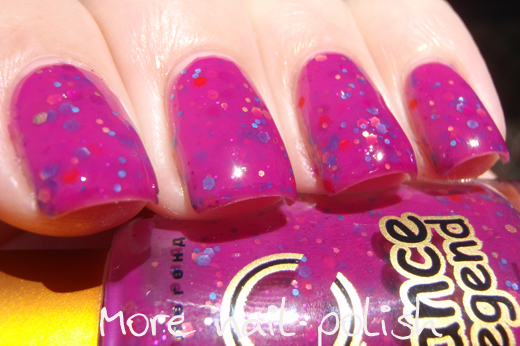 This is two coats with Seche Vite top coat. In the sun, this one bursts in to bright hot pink. 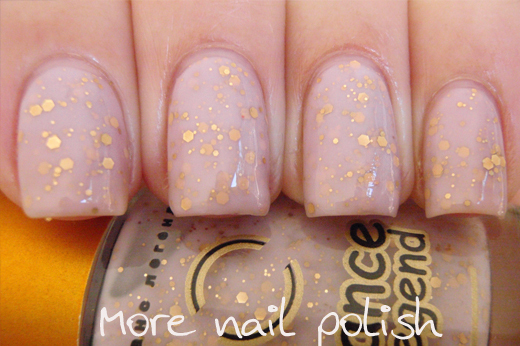 195 - This one contains three sizes of light gold hex glitter in a peachy coloured slightly off white milky base. This is two coats with Seche Vite top coat. In the sun, this one shifts to bright purple. Application is pretty good with all of these, but like with most milky glitters, you will want to let each layer dry properly before starting the next layer. Otherwise you might drag the glitters down through the milky base making it streaky. I see these polishes as perfect for office workers where work appropriate nail polish is required. All the "inside" shades are pale and subtle, with just a flash of sparkle peeking out from the milky bases. Then you step out for lunch and POW - your nails come to life. The colour changing effect on these is very fast. The change between shades within about 2 seconds of either exposure to sunlight or removing that light source. There isn't really an in between shade. I'm going to give in and try something from Dance Legend if you keep reviewing their stuff. Sometime, lol! Wow that really is dramatic! 195 is my favorite :). 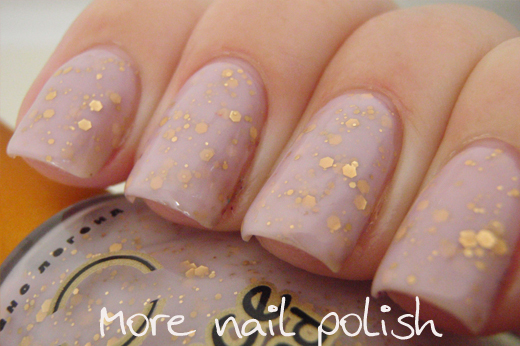 Omg, I'm drooling over all the polishes! 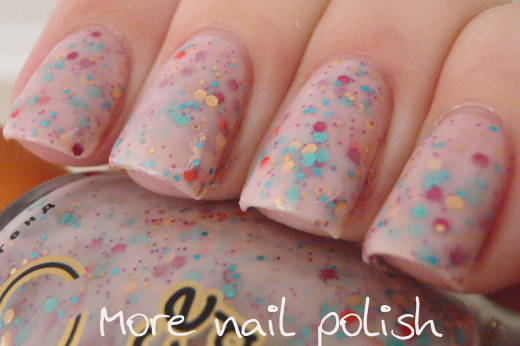 I love milky glitter manis! 194 & 195 are my picks!